Beijing is encouraging its citizens to step up their anti-mosquito battle from next week, which has been identified as the start of the peak season for the pesky bloodsuckers. City disease control authorities have called on the public to be on the alert for increased numbers of the buzzing insects from next week until the end of August. Residents meanwhile, are confused over which anti-mosquito products to buy, as while foreign imported repellents can be pricey, consumer authorities have warned some domestically produced brands can contain high levels of toxic ingredients. According to a statement from Beijing Centers for Diseases Control and Prevention (CDC) Wednesday, the density of mosquitoes in Beijing has increased by 16 percent compared to last summer. According to monitoring results, more mosquitoes congregate in local residential communities, rather than other environments such as tourist sites or parks. "The recent rainy days have brought the invasion of unwanted visitors. There are more mosquitoes in residential compounds, as hot and humid weather is perfect for breeding," said Yang Dan, an official from the CDC. "Fortunately, mosquitoes which carry dengue fever or encephalitis are not the main kinds we have in Beijing," said Yang. The CDC appealed to residents to quickly act on the anti-mosquito campaign in households, as high numbers of the biting insects can be expected for at least a month. On Wednesday, a female sales manager surnamed Xu, from Shuangjing Carrefour supermarket, said the employees have to refill stocks of over 15 kinds of mosquito repellent product every two to three days. Mosquito coils are the top sellers, she said. Meanwhile, online stores selling "imported organic mosquito sprays" or "non-toxic US mosquito coils" are also seeing strong sales. A local resident, surnamed Zhao, who owns a store on online shopping site taobao.com, said she sold over 310 bottles of US mosquito repellent in July, the highest record for her shop. The reason for the strong sales is because domestic brands are "quite toxic," alleged Zhao. The imported repellents sell for between 58-128 yuan ($9-20), while in Carrefour, the Chinese brands cost as little as 10-22 yuan. "Most buyers are parents with babies, and they're afraid of the potential toxicological effects of the smoke from the mosquito coils on the babies," said Zhao. However, on Wednesday the Beijing Daily reported people who favored the foreign brands have ended up disappointed. 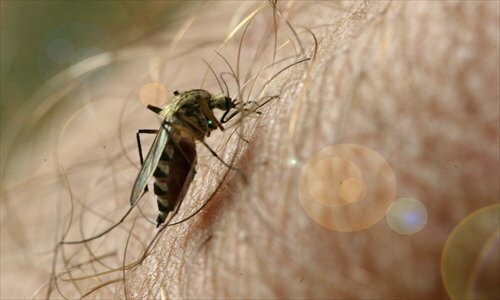 "It worked fine when I was in the US, but it seems too mild for the mosquitoes in Beijing," a resident surnamed Zuo from Dongcheng district told the Beijing Daily. Yang Baodong, a professor from Beijing University of Agriculture, thinks this is because Chinese mosquitoes have developed a higher tolerance to pesticides. "The failure of foreign mosquito repellents has a lot to do with different species of the insect in different countries," said Yang. "Local mosquitoes apparently have stronger tolerance to the low levels of pesticides the [foreign] coils contain," said Yang. In July 2011, Beijing Consumer Association (BCA) issued a warning over the widespread use of mosquito coils, after conducting a nationwide sample survey of 30 products from 18 local brands. Seventeen percent of the samples exceeded the national standards of pesticides the products should contain. BCA said all the mosquito coils on the market are slightly toxic, and families with children and pregnant women must not use such products in the home. "Burning mosquito coils releases various aromatic compounds that do have harmful effects on airways. And it has been estimated that burning one for over six hours produces particulate matter smoke equivalent to about 80 cigarettes," said Yang Shuxia, a doctor from Peking University First Hospital. "I don't feel there are more mosquitoes so far [this year], but usually only one of them will destroy a good night's sleep," said Gao Qing, a female resident who bought domestic mosquito sprays to prepare for the summer. "A burning mosquito coil usually smells horrible, especially when we have to close the windows while the air-conditioning is on, and if it is powerful enough to keep mosquitoes away and kill them, it must contain toxic particles harmful to humans as well," said Gao.